Brightvar.bid is the PUP that uses misleading techniques to prevent removal. Use Reimage to locate malicious components and get rid of them faster than with uninstall instructions. A full system scan blocks virus reappearance and prevents traffic to malicious domains. Brightvar.bid - adware which infiltrates the system via bundles. Brightvar.bid is an adware-related website which provides “useful” features to trick gullible users. This program offers to share various URLs on the Internet to receive income. However, adware comes with other regular software secretly and fills your computer and affected browser with numerous advertisements. These are the main reasons why Brightvar.bid virus is also called a PUP. Moreover, such programs have abilities to collect non-personal data, redirect users to developer-promoted pages, etc. Browsers are slowing down each time you try to search on the Internet. If you see such signs, there is a very big chance that adware has affected your computer system and occupied your web browser. To remove Brightvar.bid virus and avoid further possible consequences such as redirects to potentially dangerous websites, you need to install Reimage or go through the manual elimination instructions which can be found below this article. Performing the Brightvar.bid removal is important also for another reason. Note that adware usually collects all information that is related to your browsing experience and browsing habits. Such information might include various search queries, pages visited, photos viewed, saved bookmarks, and IP addresses. Make sure you clean the browser that was infected by the adware and remove all unknown browser extensions, plug-ins. All PUPs are very similar to one another and have the same distribution techniques which we are going to discuss in this article. Make sure you take all precautionary measures to avoid potentially unwanted applications as they are created and promoted for beneficial reasons which positively affect only the developers. 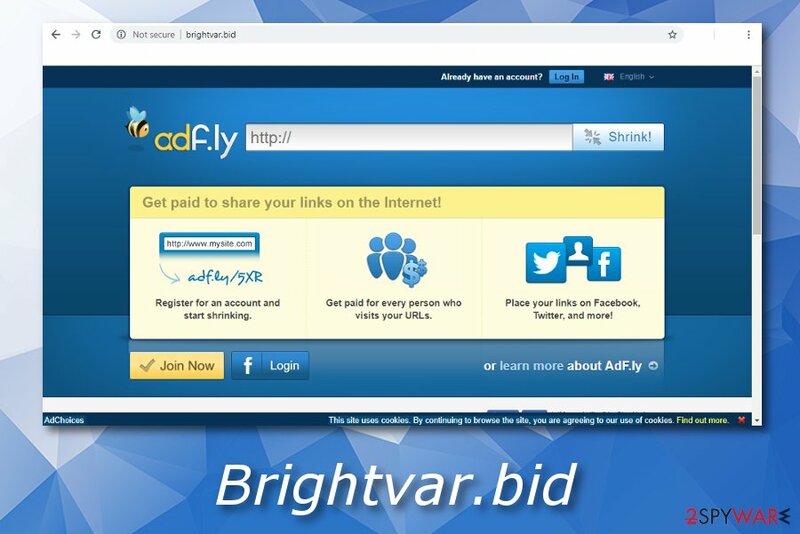 Brightvar.bid - an adware-type application which uses the cost-per-click method to gain revenue from ads. According to IT experts, adware can be spread through original programs which users often download from free websites or file sharing sources. Moreover, ad-supported applications can distribute through rogue websites which are promoted by secondary sources. These are the most popular adware distribution techniques and you need to learn how to avoid them. First, use the Custom or Advanced installation mode rather than the Quick/Recommended one. Here you will be able to track all incoming downloads and opt-out the unwanted ones. However, the best choice would be to use only original installers and avoid questionable downloading sources. Moreover, stop visiting dubious-looking sites as there is a big chance that such pages lack protection. Install antivirus software for your computer safety. This program needs to be updated once in a while and it will keep your computer system safe from various cyber threats which you might overcome on the Internet. Perform the Brightvar.bid removal automatically to get rid of the adware infection in a faster and safer way. All you have to do is download and install anti-malware software. You can choose from our suggested ones or download a tool that you are likely to run on your computer. Antivirus programs will deal with the cyber threat in a couple of minutes. Moreover, you can remove Brightvar.bid virus by using manual technique. Such method requires lots of the user's involvement. You will need to clean affected browsers such as Google Chrome, Microsoft Edge, Internet Explorer, Mozilla Firefox, and delete all dubious-looking browser extensions, plug-ins, and applications. Here, look for Brightvar.bid or any other recently installed suspicious programs. Wait until you see Applications folder and look for Brightvar.bid or any other suspicious programs on it. Now right click on every of such entries and select Move to Trash. When in the new window, check Delete personal settings and select Reset again to complete Brightvar.bid removal. Once these steps are finished, Brightvar.bid should be removed from your Microsoft Edge browser. Here, select Brightvar.bid and other questionable plugins. Click Remove to delete these entries. Now you will see Reset Firefox to its default state message with Reset Firefox button. Click this button for several times and complete Brightvar.bid removal. Here, select Brightvar.bid and other malicious plugins and select trash icon to delete these entries. Click Reset to confirm this action and complete Brightvar.bid removal. Here, select Extensions and look for Brightvar.bid or other suspicious entries. Click on the Uninstall button to get rid each of them. Now you will see a detailed dialog window filled with reset options. All of those options are usually checked, but you can specify which of them you want to reset. Click the Reset button to complete Brightvar.bid removal process. ^ Internet Protocol Address (IP Address). Techopedia. IT encyclopedia. ^ Usunwirusa.pl. Usunwirusa. Cybersecurity news site. This entry was posted on 2018-09-21 at 09:25 and is filed under Adware, Viruses. You can quickly scan the QR code with your mobile device and have Brightvar.bid manual removal instructions right in your pocket. How did you remove Brightvar.bid?